Chemistry Experiment: Illustrate how a set of related compounds create a chemical system, termed a buffer, which is resistant to change in pH. This experiment was broadcast live over the internet via satellite. We introduced the experiment with a coverage of common acids and bases found in a typical home. Next we introduced how physical exertion causes the production of hydronium ion (a proton attached to a single water molecule, H3O+). The hydronium ion combines with the buffer in our blood stream, and is transported using a protein (carbonic anhydrase) as carbonic acid, H2CO3. In our lungs, this acid is exhaled as carbon dioxide (CO2) and water (H2O). Therefore, the first portion of the live experiment was in fact the reverse of what happens in our lungs; when Youth Ambassador Barbara exhaled into water, the CO2 in her breath recombined with water in the beaker, forming carbonic acid, H2CO3. Full result details available here! During the expedition chemistry professor Dr. George Agnes will draw lessons from Salar de Uyuni's unique environment to illustrate fundamental chemistry principles. 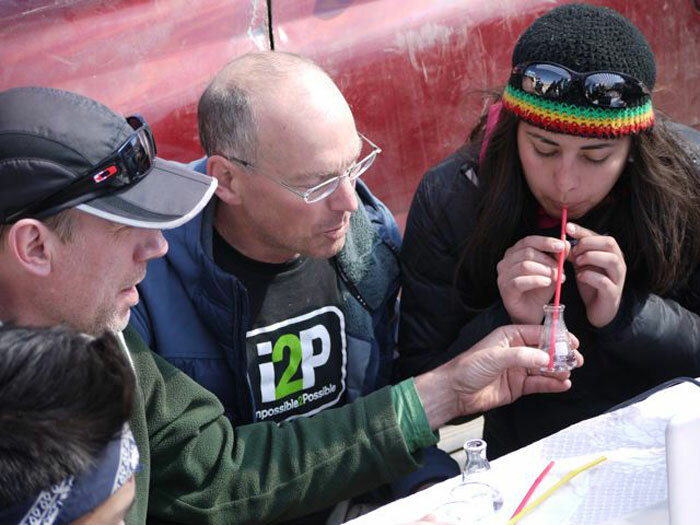 On a daily basis the i2P team will conduct fascinating chemistry experiments that students following on-line can observe and replicate in their classrooms.